With the ultimate in fragrant flowers, a gardenia bush is one of South Florida's most beloved plants...though it can be a challenge to grow. These plants flower profusely (more so as they mature) in spring and early summer (usually March through June), and then bloom on and off the rest of the warm months of the year. But there are important things to know about growing gardenias before you run out and buy one. This is not meant to scare you. These shrubs are not impossible to grow...they're just picky about certain aspects of their environment. So the more you know about gardenia care, the better prepared you'll be to grow them successfully to enjoy for many years to come. For acid loving plants like these (and azaleas, as well), placement is the key to success. 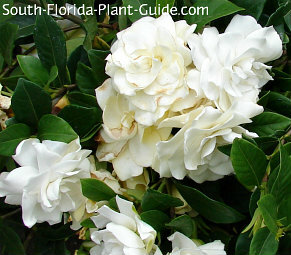 Gardenia bushes cannot take alkalinity in the soil without incurring nutritional problems. They need to be planted away from concrete foundations and walkways where concrete will leach into the soil. Areas with a pH of 7 or above (often from shell or natural limestone) will make it a struggle for you keep the plant happy and healthy. 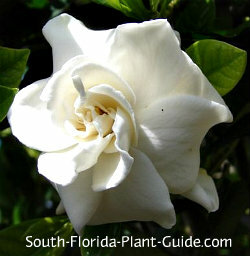 You may want to have the area where you want to plant tested for pH before you purchase a gardenia. The ideal pH for these shrubs is between 5 and 6.5. Call your county's extension office for testing info. And don't even think of planting a gardenia near the beach - it's extremely salt sensitive, so you're just asking the plant to commit suicide. Bugs seem to love these plants almost as much as we do. You'll want to check regularly for any signs of insect activity...aphids, mealybug, scale, whitefly are all fond of gardenias. Sooty mold is very common and it's often the first indication you'll notice that insects have taken a liking to your gardenia bush. The mold is a blackish residue that forms on the leaves, and indicates your shrub has a pest problem (the mold forms on the secretions of insects). See the section on Plant Problems for more information on plant pests. These shrubs need regular irrigation. Too much or too little stresses the plant, inviting pests. You may experience bud drop - where buds form but drop off before opening. This can be a water or a pest issue. Bright yellow leaves are another common symptom on these plants and can indicate too much water or a reaction to cold temperatures...or the leaves are just old and about to fall off. 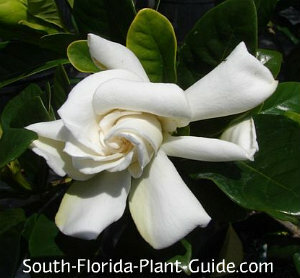 Gardenia bushes have special nutritional needs, too - see the Plant Care section below. Other than all that - easy peasy! These shrubs vary in size by variety. 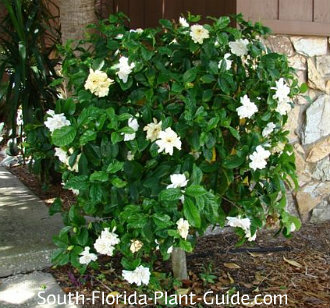 Most are larger plants, like the popular Miami Supreme, that can be kept about 4 to 5 feet tall by 4 feet wide, though some dwarf gardenias are available that only grow to about 2 feet. Some cultivars like Veitchii are full-size shrubs that have smaller blossoms and leaves. Buy a grafted plant (usually all gardenias sold in nurseries are grafted) to avoid nematodes, which feed on the shrub's roots. A gardenia bush is considered deer-resistant, though there are no guarantees. 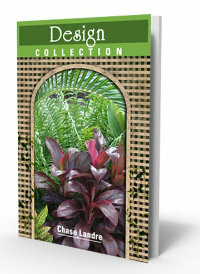 COMPANION PLANT SUGGESTIONS: Pair with foxtail fern, Xanadu philodendron, star jasmine, dwarf tibouchina, Maui ixora, Aztec grass, snowbush, dwarf powderpuff, and angel's trumpet.